These photographs have been kindly compiled by Patrick Ellis. They are presented in geographical order - the letters of the titles refer to the road or street (eg CE = Chapel End) followed by the house number. Specific acknowledgements of ownership: every effort has been made to trace and contact copyright holders but this has not always been possible. We apologise for any infringement of copyright that may have resulted. Click on a thumbnail to see an enlarged version and a brief historical description. The image will open in this window and may take some time to load. 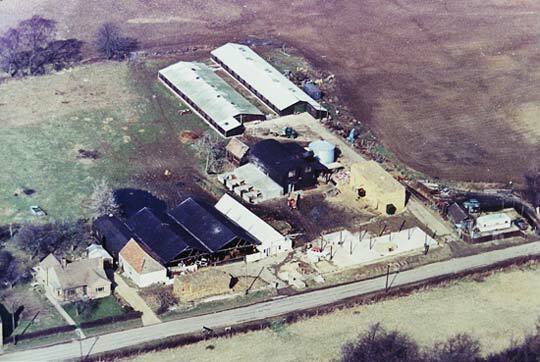 An aerial view of Manor Site Farm from winter or early spring of 1965. From left to right the farm bungalow, 87 Main Street. The garage and black roofed cattle yards have been demolished early 1980's due to wood rot in the structural timbers, A replacement steel framed building now covers the same area. The tile building near the bungalow and the cow shed white front still exist. further right, the main farm yard (stack yard) with a Massey Ferguson 135 and trailer (almost new) backed up to the granary which had a corn drier and grain handling elevator. Barley and oats were stored on the first floor and used for animal feed on the farm. The silver "Butler" grain silo held most of the farms wheat..To the left of the granary, pig sty's .Further to the top of the picture, two broiler chicken house. The one on the right burnt down in a fire in the early 1980's but in the meantime a third house had been built to the left. So a google view will still show two sheds. Beside the main road (B660) a pole barn is under construction with a Vauxhall Cresta ?? car close by. A familiar landmark still standing is the milk churn stand. To the right is the site where no 89 Main Street now stands.